A Georgia middle school student was taken into custody after allegedly stabbing a teacher with an 8-inch butcher knife on Monday. The alleged assault happened at Trickum Middle School in Lilburn, Georgia, ABC News reported Tuesday. The statement added that no other students or staff were hurt. 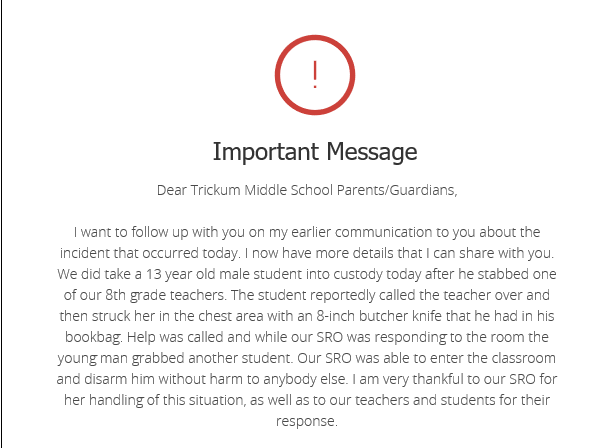 There did not appear to be an incident between the teacher and student that led to the stabbing, Gwinnett County Public Schools Executive Director of Communication Sloan Roach told The Daily Caller News Foundation in a phone call. 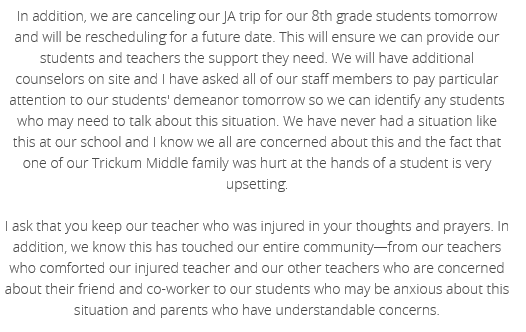 The district is not releasing the teacher’s condition and the identities of both the teacher and the student at this time.